$5.00 Coupon Book. The Goforth Supply Co.
J. T. Goforth, storekeeper and landowner was the towns namesake when it was settled in the early 1880s. The town built its first school in 1881 and a post office opened in 1890 (closed in 1902). It was the center of cotton ginning for eastern Hays County. From a forward-looking population of 100 people in 1890 it fell to just 20 by the middle of that decade. The cotton ginning business and the local farms continued to prosper, without benefit of a populated town center. The thin soil became exhausted, a flood in 1913 and then the boll weevil infestation in the 1920s doomed Goforth. A school for Mexican-American children remained until consolidation in the late 1940s and today only the cemetery marks the former town. 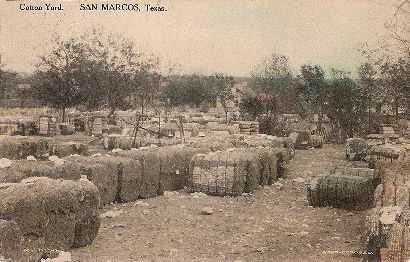 Once the center of cotton-producing activity in Hays County. Goforth became a ghost town during the 1920s. The community was established in the 1870s by James Taylor Goforth (1849-1915), who operated a general store at this site. Goforth's store served as a social center and as a banking facility for many of the farm families in the area. Business activity in Goforth was at its height between 1880 and 1906. The town boasted a drugstore, doctor's office, meat market, stable, and blacksmith shop. A U. S. Post Office opened in 1890, with J. T. Goforth as postmaster. 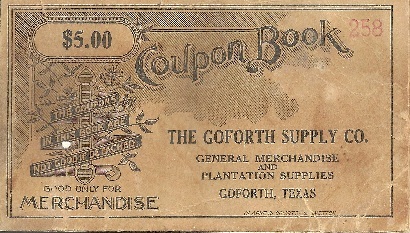 In 1894, J. M. Butterworth purchased Goforth's store, but closed it three years later when the Goforth Supply Company was organized. The town's founder later formed a gin and milling company that operated one of the largest cotton gins in the area. Despite the fact that rail lines had bypassed Goforth, the community flourished until soil erosion and worn out farmland combined to bring extensive crop failure in 1925. A worm infestation in 1926 caused total abandonment of area farms. The supply company closed that year with stock still on the shelves. 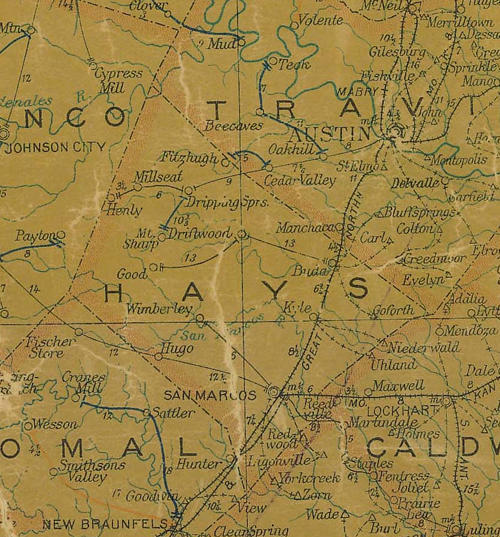 Although little evidence remains of the townsite, Goforth is an important part of Hays County history. We lived on a farm near FM 2001 in the 50's. As a matter a fact, Clay Thompson and his family were friends of ours. I am older than Clay, and well remember going in to the old store with my older sister, and later with Clay's siblings and other friends. We were always warned about the danger of entering that old building, but somehow we managed to survive! I still have an old calendar pulled from the ruins of that 'dangerous' old building, and like Clay's mother, my mother threw out other things scavenged. I grew up on a farm in Buda (Hays Co. TX) less than two miles from Goforth. It was east-southeast of Buda, and had a cotton gin. Apparently, Goforth began its decline when the railroad went through Buda in 1881. We used to go to the ruins of the town in the 1950s and early 1960s and had picked up old newspapers and advertising (which our mother later discarded). 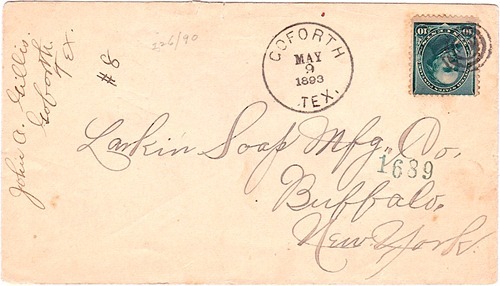 We still have several old bills of lading from the Goforth Mercantile dating from the 1890s. Goforth had a post office, schools, at least one church and a cemetery or two. Unfortunately, someone purchased the property that the old stores sat upon in the late 1960s and burned everything. Evidence of the cotton gin is still visible on the county road. One church still exists and the cemetery is still in use.